Maxon motor provides some insight into the modes of failure for DC motors and what to consider to prolong their life. Firstly let’s address the elephant in the room, who is not wearing the right gear? Who is not handling the motors with care? If a DC motor is not handled with care, it can be damaged, stopping the motor from functioning as it is designed to. If you drop a motor it could dislodge small components within it or even fracture them. An important factor to consider is ESD (Electro-Static Discharge), which is critical for brushless motors. ESD could damage the hall sensors or encoder, rendering them useless and unable to get any feedback from the control system. Brushless motors commutate electrically through Block or Sinusoidal commutation. Studies show that you can generate up to 15,000 volts in the human body so by releasing that energy you can short-circuit a motor. That’s why wearing the correct gear and thinking about how you are going to handle the motor is crucial. Before even having bought a motor some environmental conditions must have been considered. This question should have been considered beforehand, what is the ambient temperature in which the motor operates? Each motor has its own operating range and this is dictated by the heat reliability of the materials and the viscosity of the lubricant in the bearings. If the actual ambient temperature falls outside this range, then expect failure sooner than you wanted. At low temperature the lubricant will freeze and increase friction within the bearing causing increasing wear and excessive axial play due to shrinkage of components. You will have the same consequences operating at high temperatures, however in this case the lubricant will become a liquid and it will run away from the areas where lubricant is needed. Another element that might need to be considered is the humidity of the environment in which it operates. High levels of humidity can cause corrosion within the bearing which causes increasing level of friction which has a growing effect on wear. This may damage the shaft and the bearings restricting the smooth rotating operation of the motor which can affect speed and torque. It also will lead to contamination within the drive due to the abrasive nature that is corrosion. Let’s look into the motor. In DC motors they commutate using brushes, whether it be graphite or precious metal. It is the brushes that limit the life of these motors and it is the ball bearings that limits brushless motors. The life of these brushes can be influenced by a number of factors; the use of high current loads will cause massive electrical wear, high speeds will considerably impact the mechanical wear on the brushes, the type of operation can significantly deteriorate the brushes if the motor is used for extreme start/stop and left/right operations and temperature, humidity and vibrations, all contribute to the demise of a brushed DC motor. In brushless motors will fail once the bearing has been worn out due to the previously discussed factors, but in addition; residual unbalancing and bearing load have an impact on bearing the life. There is given data for each motor in which are its limits and operating ranges and reality is… that it is not always followed, so time and time again motors fail for this very reason. The key parameter to note down is; thermal time constant of the winding. DC motors can be overrun, but not for long periods of time. 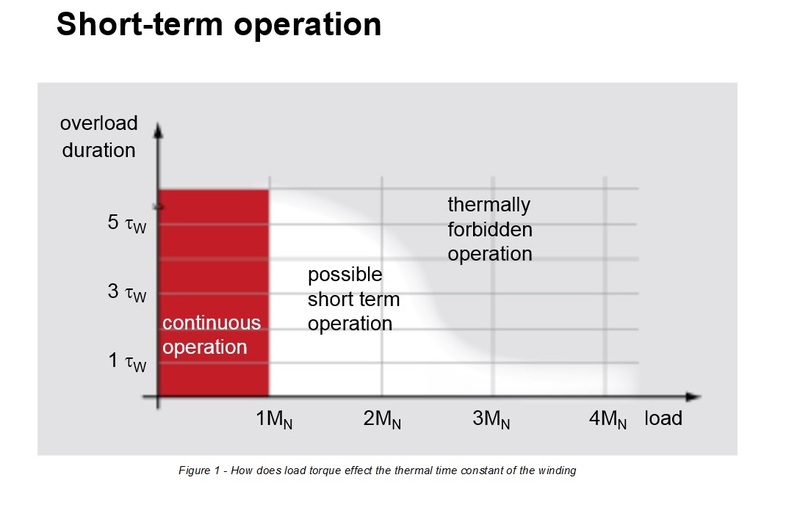 The thermal time constant of the winding is what dictates the maximum operating time for an overload. If we look at the DCX 6 M in the maxon motor range, it is said to have a thermal time constant of 1.71 seconds, so that motor should only operate for that period while overloaded by around 2½ times the nominal torque. (In maxon motors, torque is directly proportional to the current, so when torque increases, it has a higher electrical current load demand). By operating for longer periods, the winding will melt due to the excessive current which is producing large amounts of heat leading to the motor seizing. So you can see there are many factors to consider when selecting a suitable motor for your application and selecting the right motor can lead to a much greater life-span.